If You Build It They Will Come! Getting Over Your Fear of Yoga Marketing. I hear this all the time. In fact, believe it or not, I used to feel the same way. Stay with me, and I’ll share my first-ever, kinda embarrassing piece of self-promotion! They wanted me to succeed, and I was the new kid on the block. The studio was well-established, but relied on a small student body drawn directly from the neighborhood, mostly by our fairly famous marquee teacher. All of us other teachers were her students, and the general perception was that we were second-best carbon copies, basically trying to be like her and teaching a similar class less expertly. This wasn’t far from the truth. But even though these mentors were proactively seeking to support me by suggesting I create a flier, I am sure I responded with a facial expression and tone of voice that registered as being almost mortally offended. I had a youthful and self-righteous disdain for sales, marketing, and of course the vulnerability implied by putting myself out there. You see, I had this hidden script that if I was good enough, people would just come to my class. They would flock to me, word would spread and I would be universally adored for my uniquely insightful, life-changing classes and natural leadership. 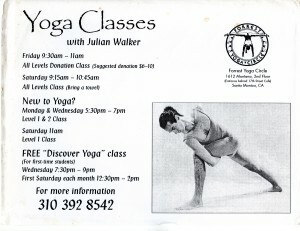 Now, bear in mind, this was the mid 90’s, I was such a non-techie little long-haired vegan yogi, in my tiny one room apartment with no TV, no computer, and certainly no email account! 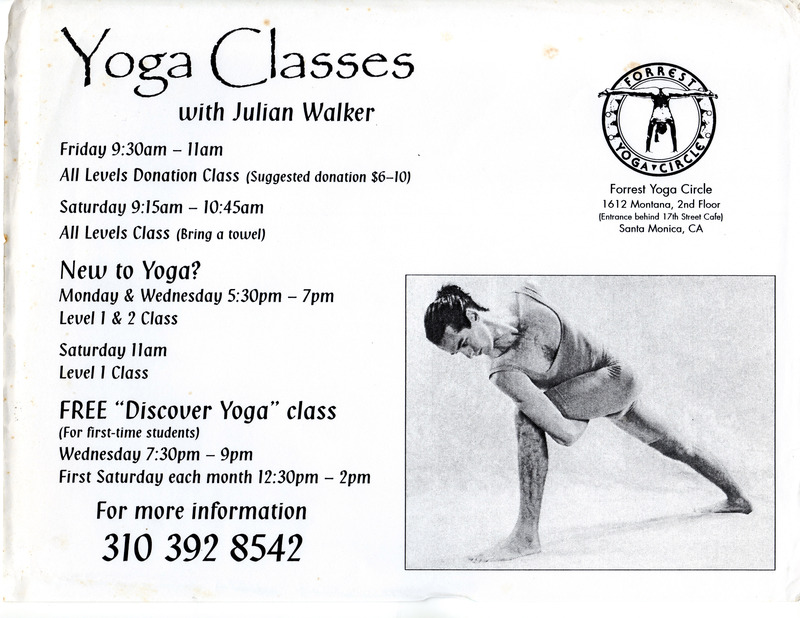 At this point in time, no ordinary people had websites or email lists, and “PR” was basically something our yoga studio did with fliers posted around town and a snail mail data base on an ancient computer that printed up reams of sticky labels once every month or two to announce workshops, and changes to the daily class schedule. Laborious! Like the leotard? I was so poor (and charmingly clue-less) it was a hand-me-down from a neighbor’s wife! The medium length hair pulled into a half ponytail/bun? Smooth. Notice my home phone number is on the flier? I even had an answering machine with a message that included my schedule and info on any upcoming workshops. But thankfully people didn’t just randomly call me at home on my landline, they just knew where and when my classes were from seeing my flier —and enough of them came for me to keep paying my bills! What convinced me to get over my hesitancy about making the flier? Better photo, better haircut, still wearing tights, but whaddyawant? I was secure in my sexuality! Check it out, though, when you click on it for the larger view: I have classes at two different studios but am promoting them as two parts of one practice, one community —now I understand it as one brand. There is a retreat announcement (this was my first), multiple workshop teasers, a book available at the front desk, and yea, a website address. I guess I caught on over time, huh? What did I catch on to, though? Essentially, this: we are in a fee-for-service industry that relies on people walking in the door (or opening their front door to you if you are teaching privately) every day and giving you their money to share an experience with them. It’s a fantastic photo by my good friend, the famous Robert Sturman and really amps up the vibe-factor, includes some accolades (click on the image to see that I was awarded both “Best Yoga” and “Best Bodywork” by the massively circulated LA Weekly newspaper!) 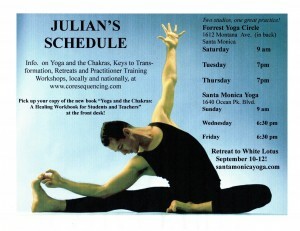 and serves to let people know when I am teaching each week, while directing them to my website. If you don’t think this is a sales job, you have missed something crucial to your success. We are selling an experience, a set of benefits, a community connection, a context of values, a sanctuary for inner work created by our attitude, vocabulary and skill set —and we have to sell it every day, authentically, ethically and convincingly to get people to come back for more. The most successful teachers do this very, very well, even if they don’t know it explicitly. The teachers who don’t succeed might be just as skilled at teaching, but not at selling the experience. 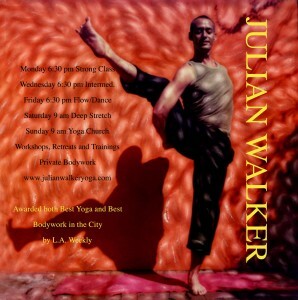 Most likely, if you are reading this you feel the calling to share yoga as much as you can. You have tasted how fulfilling this is, and you dream of having it be your primary job, your source of income, the way you are valued in the world on a daily basis. The number of students and clients necessary to form the other side of this equation of a fulfilling business model will not just drop onto the mat in front of you because you are so sincere or awesome, even if you really deserve it! You have to build it, so they can come. And by “it” I don’t just mean your vision board, although that can be a great start… I mean your business model, your “simple marketing loop,” (which you can learn about and implement in the FREE eBook available in the sidebar!) your intentional way of showing up and taking responsibility for being in an extremely privileged profession that includes sales and self-promotion. As we all know, the internet changed everything. You don’t have to print out reams of sticky labels to put on envelopes that you then lug to the post office after filling them with printed fliers. Then along came social media, and changed everything once again: everyone has a website linked to their social media profiles, Twitter accounts, and (if they’re smart) connected to an email list they are building. It has never been easier to reach thousands of people who might be interested in what you most passionately want to share. Yes, there is a lot of noise out there, a lot of voices clamoring for attention. But don’t be discouraged. Start crafting your unique, authentic, sincere message today, and we’ll, explore ways to get it out there together. My 3-week online video course Keys To Freedom is NOW OPEN for Registration and runs February 20 to March 13, 2017! Homework: Open a journal or Word document and write down any negative reactions you have to the idea of sales and marketing as part of your yoga, massage, coaching or other service oriented profession. Write in the voice of the part of you that disdains, judges or feels uncomfortable with the whole concept of self-promotion. Read what you have written, take a few deep breaths and see if you can reframe this for yourself. Write down some counter arguments, some reasons it might be good to get past this hurdle and find your way into embracing the business reality of your dream job. Next, try writing a 4 sentence Bio for yourself that describes not only your qualifications, but also creates an accessible, emotive, vibrant impression of who you are and what you share. Keep this writing somewhere safe, so you can look at it again in the future. they WILL be drawn to you, both by your reputation and how you craft your message and online content so that they can find out who you are and what you have to offer… 🙂 great to have you on board jackie! yea, we have to build it so they can come to us, and just visualizing it is a good start but without taking action, it’s an incomplete strategy!! Thank you for all your support and encouragement. I have been working on my website and taking all of your suggestions. I look forward to sharing my progress with you soon. Today I spoke with Dr. Wirga after I taught my classes with her about gathering a list of doctors in the area who would be open to sharing my services with patients. My plan is to meet with those doctors and offer a free session to them so they know what my work is about. I’m a little nervous but mostly excited. Much gratitude your way. P.S. the yoga leotards are groovy.